Welcome back! In our last blog we started talking about the strange noises that your car could emit when it’s in need of a trip to the local mechanic. We touched on thudding sounds when you brake, and determined that you might need new rotors. Our auto repair mechanics also touched on squealing coming from your engine, and how it could mean you need a new serpentine or timing belt. 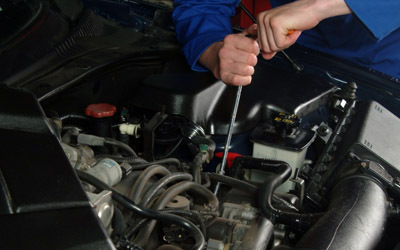 Let’s continue to visit sounds that your car might make, and see just what problem might be ailing your car. Does your car squeal when you brake? As you approach stop signs and red lights, or even other drivers, do you hear a wretched squealing sound? If so, this could mean that your brake pads are deteriorating and you need new ones. Does your car sputter when it’s idle? When your car is sitting at a light, or you have your car idling for whatever reason, do you hear a sputtering sound? If you hear what sounds like a rhythmic squeaking, it could mean that your water pump is failing, and it’s time to replace it. Why won’t your car turn on? If and when you go to start your car and it immediately doesn’t turn over, you know there’s an issue. Chances are you left your lights on, or something in the car was left on overnight and took all of the energy right out of your battery. This is an easy fix with a jump and a recharge of the battery. However, if you go to start your car and hear a clicking sound coming from the engine, it means your alternator is failing, and could potentially need a new one. Paying attention to the many sounds that your car can make is important. Keeping a balance between knowing when to get your car fixed, and knowing when your car is making a normal sound can only be found by educating yourself on how your car works, and where those sounds can come from. If you’re in need of car repair, contact your Top Rated Local® Shannon Family Automotive for car repair service today.